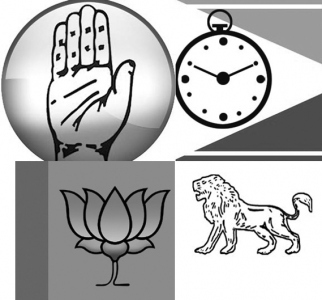 Goa News |Will Bihar results change Goa’s political equations? Will Bihar results change Goa’s political equations? The results of Bihar Assembly election that shook the whole country as well as central BJP government has not spared even Goa, which is going for the Assembly poll within 15 months. The Goa Assembly election 2017 would be crucial since the wave of Parivartan in 2012 state poll had ultimately replicated at the national level general election held in 2014, which gave a thumping majority to the Bharatiya Janata Party. Almost all the politicians, belonging to all kinds of political ideologies and groups, were closely watching the Bihar results since Delhi Assembly poll had already made the ruling BJP bite dust. As a result of Mahagathbandhan of regional forces like Nitish Kumar and Lalu Prasad Yadav with a national party like the Congress literally wiped out the BJP also from Bihar. WHO ARE VIJAI’S PROBABLE ALLIES? “I have been saying consistently that the time has come for a Grand Alliance even in Goa”, says once again Vijai Sardesai, Fatorda’s independent MLA. After winning all the 11 seats from Fatorda Assembly constituency in Margao municipal election held on 25 October, he has converted his ‘Fatorda Forward’ slogan into ‘Goa Forward’, planning a state-level strategy for the next Assembly poll. He is obviously banking upon the five independents – three from Salcete besides Rohan Khaunte (Porvorim) and Naresh Sawal (Bicholim), from among the present legislators. Rather than persuading the ‘right wing’ Maharashtrawadi Gomantak Party, he is also eying the rebels within the ruling BJP, like Michael Lobo from Calangute, whose winning prospects would be minimal in the BJP. Sources in the Congress claim that he has also continued secret talks with the Congress for his Ghar Wapsi, which may not happen now if Bihar result pushes him to play the leader of Grand Alliance. Sardesai has not opened all his cards yet, but certainly he is the most important politician to be watched now onwards. WILL CONG PLAY A JUNIOR BROTHER? In this background, the biggest setback for the Congress was former chief minister and Margao MLA Digambar Kamat, who was pushed to second position, winning only six wards out of the 11 seats in his Margao Assembly constituency of Margao municipality. Though Congress was pushed to third position in Bihar and no position in Delhi, Goa’s Congress leaders are still not prepared to act a junior brother even after losing miserably the 2012 Assembly election, in a similar manner. Congress, which has been ruling Goa since 1980 either as a party or its splinter groups of defectors, was completely marginalised in the last Assembly poll, with mere nine seats – not even 10%. The party neither officially participated in the ZP elections held in March nor fielded ‘unofficially official’ candidates at municipal elections held last month to regain its position. Everything was a show of strength of ‘individual MLAs’ in the party, but the Congress continues to consider itself a force to reckon with. Goa PCC chief Luizinho Faleiro thus simply evades a reply to the proposal of Grand Alliance and claims that the nationwide anti-BJP trend would bring Congress back to power in Goa. He has also announced that the Congress would field 50 per cent new faces in the next election, without specifying who would be the 50 per cent old faces. Presently, out of nine, Babush Monseratte is already expelled from the party while Mauvin Godinho has openly aligned with the BJP. It looks impossible that Jennifer Monseratte, Babush’s wife, would stick to Congress once Babush says good bye to the party (and join NCP?). Vishwajeet Rane, on the other hand, gives credit of his ZP or municipal victories to his father Pratapsing Rane, the opposition leader, but not the Congress. The statement speaks for itself. With this, the nine-member Congress actually remains with only four legislators – Digambar Kamat, Babu Kavalekar, Pandurang Madkaikar (political friend of Monseratte) and Aleixo Reginald Lourenco (political friend of Vijai Sardesai). While Goa had elected 18 new faces in 2012 Assembly election including 5 independents in the 40-member House, the voter has also favoured new faces in the recently held municipal elections. No matter what the anti-BJP forces decide in Goa, the decisive issue would be what strategy the ruling BJP coalition adopts in the next Assembly poll, especially with regard to its alliance partner - the MGP. “Bihar election has shown what happens when friendly parties are sidelined”, was the instant comment of Dipak Dhawalikar, minister in the BJP-led government and working president of the MGP. The ongoing cold war between the alliance partners – BJP and MGP – is no more a secret. In fact the BJP is more upset with its junior alliance partner making inroads in the BJP stronghold areas like Sanguem, Canacona, Sanvordem, Shiroda, Pernem etc. Sources in the MGP disclose to goanews.com that the party led by Dhawalikar brothers has made all the plans to contest from 25 Assembly constituencies, presuming that it won’t align with the BJP. CAN BJP AFFORD EKLA CHALO RE? Till yesterday, the ruling BJP cadres were divided whether to continue the alliance or not. But the party leadership, even after the debacle in Bihar, does not want to bow down. Its organisational leaders refuse to believe that Bihar election would impact Goa in any manner. “The basic difference between Goa and Bihar is that we have a strong cadre base here right up to the booth level, unlike Bihar”, says Vinay Tendulkar, the local BJP president. The ruling BJP has however still not come with a convincing justification why it could not win Cuncolim and Canacona municipal elections, represented by a party legislator and a minister respectively. It is a fact that the ruling BJP has literally swept municipal elections in its other five MLA-ruled councils while also snatching away its former constituency of Bicholim from independent Sawal. But it is also a fact that the saffron brigade is consistently failing in getting Fatorda back in the party fold and also not succeeding in capturing new forts in spite of ruling the state for over three years. The Hindutwa party could win 21 seats in the 40-member Assembly and get support of four other MLAs from Salcete due to active support of the Church and Goa’s Christian voters. But it is far from reality now that the history would repeat at least in five constituencies – Calangute, Aldona, St Andre, Cortalim and Vasco, besides all the decisive eight seats of Salcete. It thus appears that the Bihar election could compel the adamant BJP to rethink over its strategy of Ekla Chalo Re when the anti-BJP forces have started aligning with the booster of Mahagathbandhan that has shook the whole country. Goan politicians are gifted with power to invent newer equations, arithmetics, slogans and issues. What they lack in coming to some simple formula to solve Goans' problems. They do not have solutions. They just highlight the problems known by us.